WS260 is probably the most useful piece of software in this section. WS260 provides emulation for 2622D terminals on standard PCs. So, you no longer need a rare 2622D or 2649D terminal to boot your HP 250 computer. 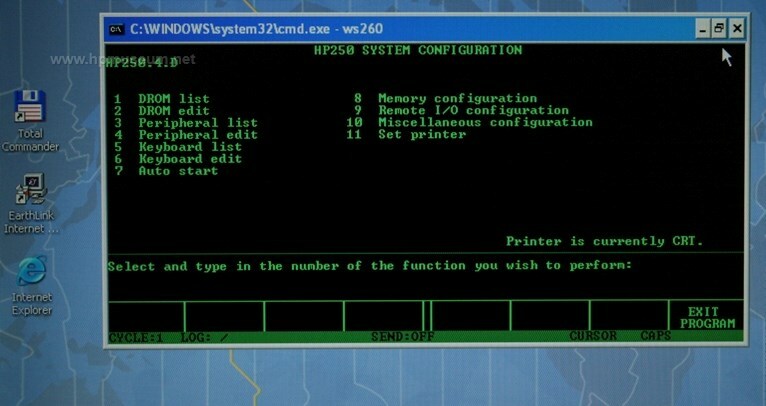 WS260 can also be used with the HP 260 computer. In addition to providing 2622D terminal emulation, WS260 will also allow you to connect standard parallel printers and other peripherals to your 250/260 using your PC. The software will also work if you have the less common 25-pin serial port on your PC. Cable details are in the manual. The COM1 port on your PC must be set to interupt 4. This is the default setting for PCs with one serial port. The software will also work on other COM ports and other interupts, but you will need to change the software configuration settings to do this (explained in the manual). The software is preconfigured to run at 9600 baud, so make sure the thumbwheel on your 250 ASI board is set to 8. You can run at a variety of baud rates, but you will need to change the software configuration to do so. Then, press the F1 key for your PC to start acting like a 2622D terminal. This tip was provided by Robert Langmeier. WS260 will launch directly using Windows 98. If you are using WS260 and the hpdrive utility (to emulate a disc drive) with your HP-250 computer, you will need to run WS260 and hpdrive from separate PCs. Even though WS260 uses the PCs serial port and hpdrive uses the PCs HP-IB port, hpdrive won't work when running from the same PC as WS260.